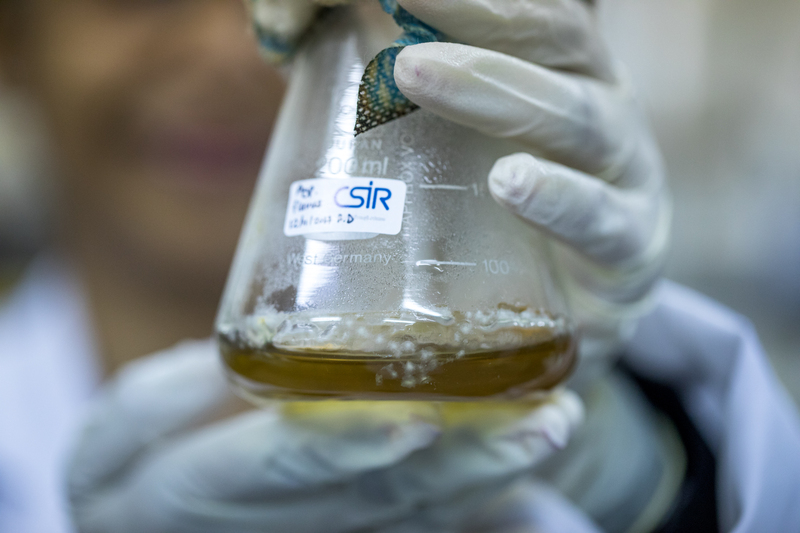 CSIR researchers are producing mycotoxins that will support the National Metrology Institute of South Africa (NMISA) to provide more affordable and easily accessible measurement standards for mycotoxin testing by laboratories locally and on the continent. Mycotoxins are produced by different types of moulds that grow on food and feed such as cereals, nuts, spices, dried fruit and their by-products, such as beverages and animal feeds. Because of their toxicity to humans and animals, mycotoxin levels in foods and feed are strictly regulated around the world. In South Africa, the Foodstuffs, Cosmetics and Disinfectants Act (Act 54 of 1972) and regulations published under Government Notice No. R. 1145, dated 8 October 2004, stipulate that all foodstuffs, ready for human consumption, may not contain more than 10 μg/kg of aflatoxin, of which aflatoxin B1 may not exceed 5 μg/kg of all foodstuffs. This regulation was recently further amended to include other mycotoxins, namely fumonisins and deoxynivalenol. In addition to the health risk to consumers worldwide, the associated economic impact stems from the fact that these foods have to adhere to stringent regulations to be exported. If testing is not reliable, it can potentially be a barrier to international trade. When South African laboratories conduct mycotoxin testing for the local, export and import markets, they need to ensure compliance to local and international regulations for mycotoxins. Quality mycotoxin standards are therefore critical for testing accuracy and reliability. NMISA constantly works to develop standards that are relevant to the region. One of the challenges is that, to validate their methods and perform routine analytical testing in the food and feed safety arena, laboratories require large quantities of traceable high-purity mycotoxins. Insufficient quantities resulted in the mycotoxins having to be imported, making it prohibitively expensive. “We are pleased that the CSIR will be able to produce the mycotoxins that we need for the certification of these reference standards. Ultimately it is a contribution to global food safety as well as empowering the country to support its agricultural sector,” says Fernandes-Whaley. 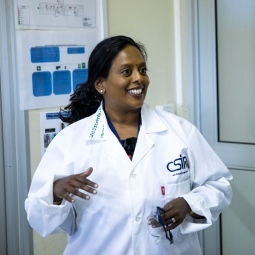 Dr Dharmarai Naicker, competence area manager for pioneering health sciences at the CSIR and principal investigator of the project, says the organisation has extensive research and development experience in mycotoxins. “We are particularly well placed to assist NMISA by isolating, purifying and producing the quantities of mycotoxin they need. We have a solid skills base in mycotoxins and a certified biosafety level two facility in which to do the work. The researchers have also obtained the necessary ethical clearance required to do the work from the CSIR’s research ethics committee,” she says. Naicker says that the researchers, who are microbiologists and biochemists by training, will be prioritising the ‘big five’ groups of aflatoxins that occur and affect foods in Africa during the first year of the project. She says that fungi typically produce the mycotoxins under conditions of stress. The CSIR’s research over many years has resulted in a knowledge base on how to grow the fungi to optimise the production of mycotoxins. The work will also contribute to broader research on mycotoxins. “We will be investigating biopharming techniques to produce recombinant mycotoxin antibodies used for diagnostic applications. We will also investigate how to optimise extraction, using other CSIR-developed technologies.” These technologies will enable the CSIR to develop point-of-care testing kits from farm to fork. To ensure that South Africa retains and builds on its mycotoxins skills and knowledge base, two Master’s candidates and one PhD candidate from the University of Johannesburg will base their degrees on the work undertaken, supervised and mentored by the CSIR and NMISA researchers. producing mycotoxins. The work will contribute to new research on mycotoxins.